Visits: 21962 persons viewed this recipe. 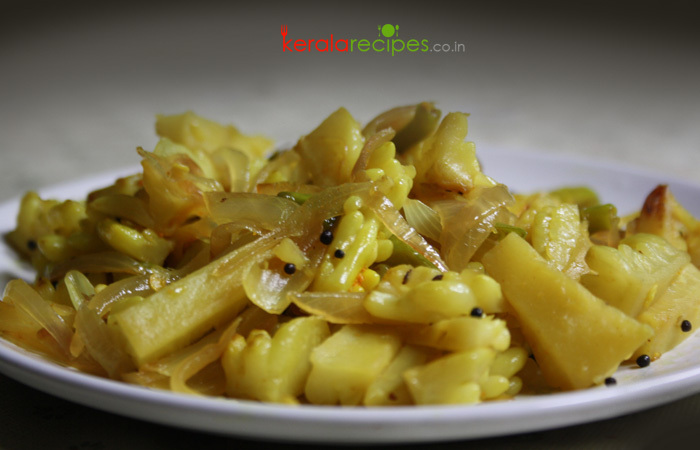 Pavakka Mezhukkupuratti / Bitter gourd stir fry – a simple dish which is usually served with rice. It is nutritious (a good source of Vitamin C) and healthy. If you are a lover of ‘pavakka’, don’t wait, go ahead. Wash the bitter gourd very well and slice it (lengthwise) into 1 inch pieces. Slice green chillies, garlic and onion. Heat 3 table spoon coconut oil in a non-stick pan and put mustard seeds. When it splutters, add coconut slices, garlic and onion. Saute it for 2 minutes. Put turmeric powder and chilli powder into it and stir well. To this add bitter gourd, green chillies, curry leaves and salt. Combine well and cook it covered (about 8-10 minutes) on low flame till done. Open the lid and cook it for 1-2 minutes to make it dry. Stir it occasionally. Taste for salt. If you are using a pan which is not a non-stick, add 1 more table spoon oil to avoid it from burning. Thank you, this recipes will help many young girls. Anju, Thanks for the feedback. Hope to see you here often.